Time to put the Bronze Beauties to bed, as an overhaul of TGGS in the offing for early 2007, so I thought I’d go out with a holiday themed blowout installment. My oft-mentioned love of this time of year follows through to all media. 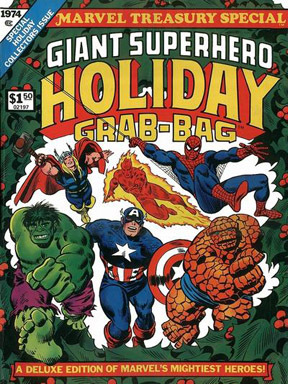 Christmas movies, music, TV shows, short stories by Dickens and Sedaris, vintage design and yep, comic books. The four collections below left impressions on me almost as indelible as the markers with which I colored some of their inside covers. Whoops. 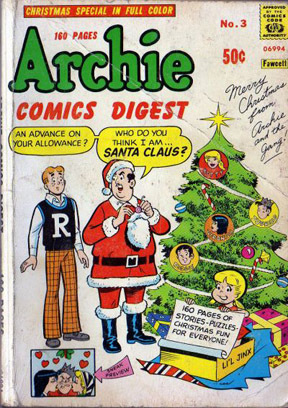 The Archie digest in particular contains such great stories and art from the 50s and 60s that the book has become as perennial to me as IT’S A WONDERFUL LIFE or Mom's sand tarts. The DC and Marvel collections (both in that great huge tabloid size that positively screamed “YOU MUST OWN ME!!! !” from the newsstands in the ‘70s) were the first of what became tradition for the publishers. 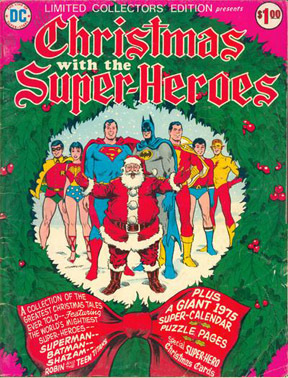 When the well of worthy holiday themed tales from the past started to run dry in the next decade, both of the Big Two started putting out Xmas comics of new material, which were welcome, but didn’t (and by definition, couldn’t) bring forth that same sense of nostalgia that old stories from a simpler time when Superman and Santa Claus could co-exist in the same story without ruining the “believability” of the character. Sheesh. 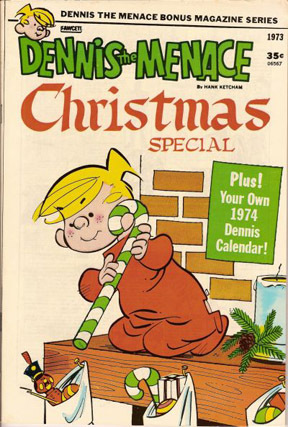 From the top, DC LIMITED COLLECTORS’ EDITION #C-34 (1975), art by Nick Cardy; ARCHIE COMICS DIGEST #3 (1973), art by Stan Goldberg; MARVEL TREASURY SPECIAL #1 (1974), art by John Buscema; and DENNIS THE MENACE BONUS MAGAZINE #123 (1973), art by an unknown Hank Ketcham ghost. And I thank you for your indulgence. Again.